So the beautiful landscape is finally completed. The shrubs, plants and trees are perfectly placed as well as the beautiful natural stones, pavers and wooden decks. Now, what? This is not over yet. A beautiful landscape will only be consistently perfect with regular maintenance and with the right irrigation. Having an efficient irrigation system is not a choice. It is a requirement and a responsibility for residential or commercial landscape owners who have chosen to tame selected plants. But watering the plants, whether with the watering can or hose, is so tiring and consumes a lot of time. This needs investment of time and energy. The worst part is, it is often forgotten. You would only be reminded when green plants are already turning yellow, and they have become sluggish and dying. Without an efficient irrigation system, plants will definitely die soon, and your once perfect landscape will turn into an ugly and uninviting plant cemetery. 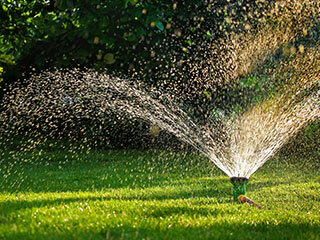 The watering can and hose have become obsolete because of the more sophisticated and efficient irrigation systems. 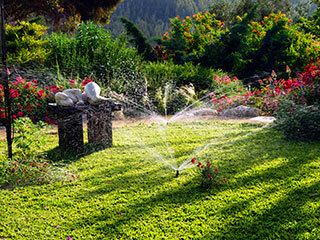 Four of the most common types of irrigation used for residential and commercial landscapes are Micro-irrigation, Flood System, Rotary Sprinkler, and Spray Irrigation System. Micro-irrigation uses a system of hoses with small outlets that will directly supply water to the roots. This is best for shrubs, groundcovers and dwarf trees. However, this is not the system for turf and lawns. The Flood System works by flooding the ground rather than spraying them with water. Roses, fruit trees and ground covers will love this system. This is also ideal for soil with a large amount of clay or adobe. Rotary Sprinkler and Spray Irrigation System are the most common choices for landscape with big lawns and turfs. As their names suggest, they both spray water to the plants. The only difference is that the Rotary can cover as wide as 100 feet of land while the Spray can only water up to 15 feet. There is no one superior irrigation system because each of them works for a specific purpose. But the most common for residential and commercial landscapes in North Carolina is the sprinkler system—either rotary or spray. There are special cases, however, when other irrigations like the micro and flooding, are the more ideal choices for some areas. Picking the perfect irrigation system is as important as keeping the plants alive. Seasons Unlimited Inc. knows just how to design and install the perfect irrigation for whatever type of landscape in the state. We are a nursery and landscape company in North Carolina. Our fields of expertise have made us the perfect company for any irrigation installation job. Installing the irrigation system is often the first task in a complete landscape installation project. It will be for your own convenience if we'll also do everything needed to design and construct your dream landscape. All it takes is a call, and we can immediately start working on your project—be it a simple irrigation service or a complete landscape installation.